Why Haunted San Diego Ghost Tours? The most reviews AND the best – our guests rate us the best of all the SD ghost tours. Our tour creates intriguing fun and memories. You’ll see and learn about the most locations in town, and actually enter more sites than any other San Diego haunted tour. Your hosts are professionals: Historically accurate, amazing storytellers featuring theatrics, horror, and comedy. Our bus tour is cozy, intimate and personal, with only 8 – 14 guest allowed on board. You get a historic tour with a haunted twist. We are the best haunted tour in San Diego – if you are looking for a SD ghost tour, we are the one. Check out Yelp, Facebook, and Tripadvisor and see for yourself – We are Diego’s top ghost tour. Haunted San Diego Ghost Tours is rated #1 on 3/4 top review sites. The major sites agree: you’re one click away from San Diego’s best ghost tour. Click on the text links below to compare for yourself with live data. 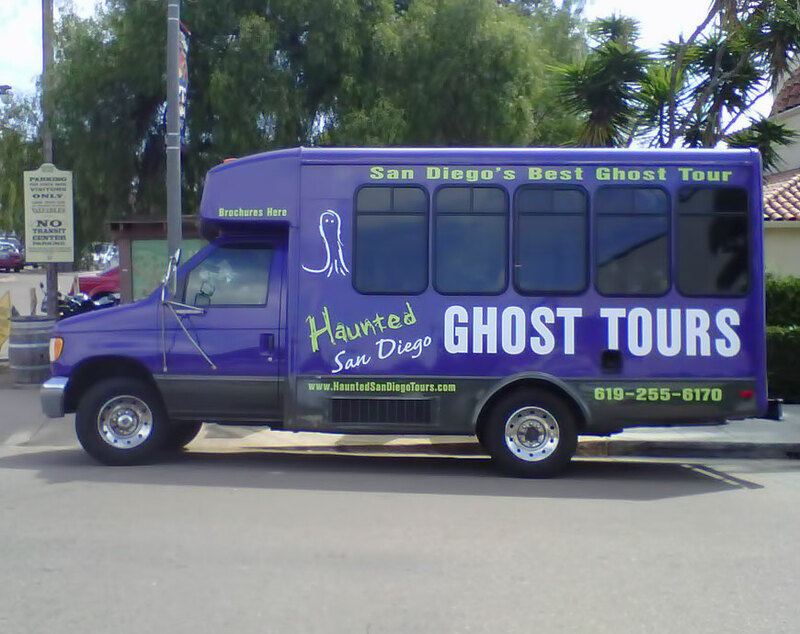 Climb aboard our custom Haunted San Diego Ghost Bus if you dare. The inside is decorated like a coffin and we can seat 14 hunters plus the driver and host. We like to keep it intimate. The host will be telling you stories and entertaining you during your travels on board. You will see the place several sources (The Travel Channel's America's Most Haunted, Life Magazine, and Time Magazine) claim is the most haunted house in the United States. Find out how it all began with Yankee Jim and it's other doomed occupants. You will see this location which is haunted by 2 people who once lived there. Strangely enough they say, it is the first person to live in the house and the last to live in the Villa Montezuma. Perhaps you yourself will hear music from beyond or see a haunted artifact move. Famous for room 309 and room 209, which are both active. One of the ghosts maybe someone you have already heard of, an infamous gunslinger, can you guess who that might be? Visitors still experience mysterious cold chills, footsteps and glowing orbs. This is the house where people would come to die as it was a hospital of sorts with a dramatic history. Our guests have experienced being pushed around the house with a hand on their back when there is no one behind them and catching mysterious shapes on camera. Back to where it all began. Old Town San Diego, El Campo Santo Cemetery has a long history of the macabre. Ghosts there are disturbed as their burial grounds have been disturbed many times. Strange figures still appear seemingly to glow and float above the ground. Spots are limited and tours may sell out suddenly. Don’t miss out – book your seat now! Have you seen our haunted tour bus? Ride the Ghost Coach – your theatre and coffin on wheels. Hear the stories of the people who lived, died, and still haunt San Diego today, as told by our world-class professional storytellers. Visit 5 documented haunted locations! Maybe you’ve seen these on TV. How about the real deal? See the Whaley House, experience the Villa Montezuma, enter the Horton Grand Hotel, enter the Horton Davis House enter the El Campo cemetery. Disembark at each location for an up close and personal frightful experience! Tickets can and do sell out. On most dates, tickets sell out faster as the day progresses. Often an unbooked tour at noon will be sold out by 4 pm. Don’t miss out! Click our Book Now button to see the available tours. San Diego is the “Most Haunted City in the West”. All social website reviews agree – we are San Diego’s best ghost tour! On your OFFICIAL Haunted San Diego Ghost Tour you will hear spine-tingling stories about real people, history, folklore, and the ghosts that make up haunted San Diego. Our 2-hour combination bus and walking tour brings San Diego history alive, one ghost story at a time. You’ll be entertained with authentic history, comic moments to lighten the mood, and genuine creepy moments. NO CHEAP “JUMP” SCARES OR STAGED STUNTS! A Haunted San Diego Ghost Tour lasts roughly 2 hours. Maybe less if there is no traffic and things go super smooth.., more if you are fortunate enough to experience a haunting event. No guarantees – the ghosts don’t work for us. Winter Visitors – Your bus is heated and we have umbrellas for you (if it rains)! Summer Visitors – Your bus is air conditioned! Cost? Just $35 per person. There’s no better deal anywhere. 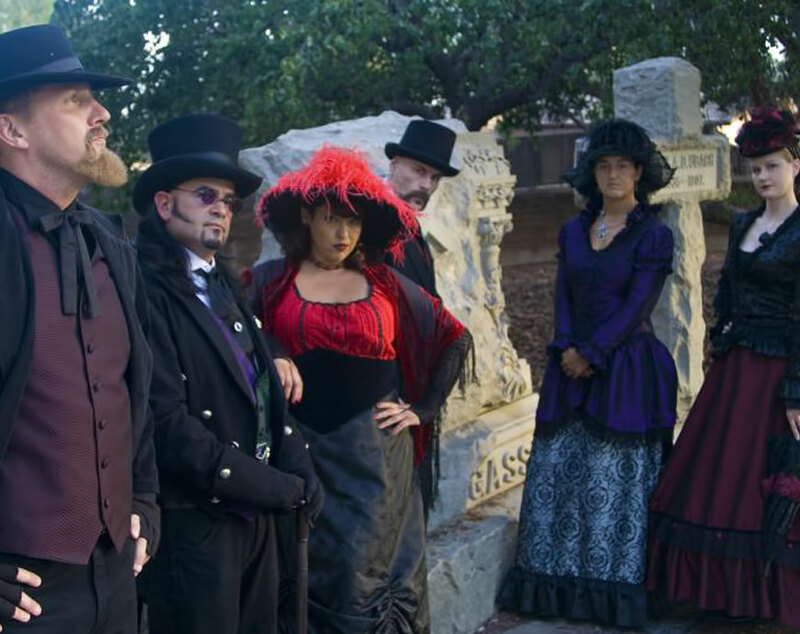 Haunted San Diego Ghost Tours is the city’s oldest and finest ghost tour. We provide you an entertaining history tour with a haunted theme, and we’re the best at it. Not a franchise or cut-and-paste tour! We offer only this tour so we can focus on providing guests with a fun and educational experience. This is true whether you believe in ghosts or not. Our guides are theatrical storytelling professionals who show you around San Diego aboard a coffin on wheels. You will have an opportunity to see haunted artifacts during our time together, and proof that ghosts exist! Disembark at each location and learn who lived and died there, who still haunts there today – maybe tonight! The Hauntings Await… Come With Us! Your tour combines guided sightseeing with a haunted bus tour and some light walking. We get off the bus at each location, but the most you’ll walk is two city blocks. You and your party will need to be able to handle the 3 steep steps of the ghost bus. Expect to stand at each stop to enjoy our tales for about 20 minutes. You can manage with a walker, but a wheelchair won’t fit. If you have ambulatory concerns, please call us for a personal answer. Here’s how it breaks down – About 35% of the bus tour is on the bus, with a host to entertain and inform, plus a driver to keep everyone safe. You’ll be walking 10-15% of the time, and standing for the rest. The tour contains mildly racy content, and some disturbing stories. It is geared toward an adult audience (PG-13). Children under the age of 10 are discouraged. Children under the age of 5 are not allowed to attend due to the lack of child-restraint seats in the bus. Anyone under the age of 18 must be accompanied by an adult – no exceptions. Yes, many kids see scary movies and enjoy them. However, going to these actual locations is heavier than “just a movie”. The eerie energy of these locations is real, and you may be surprised how many kids are not as grown up as they think they are. If your child becomes frightened, we ask that you as the parent to please comfort him. You may step away from the tour so your child may regain her composure. When the moment passes, then rejoin the tour. Ultimately, it is up to the parent to decide. If you have doubts, please call us and we can talk about it. The haunted downtown/gaslamp district of San Diego used to be called the Stingaree. It was a dangerous place. Once, it was packed with rough bars, brothels, cutthroats, cardsharps, and vice of every description. We do discuss some of these things, including prostitution. This is done lightly, not graphically, but be advised. Our tour is an engaging adventure with spooky stories. It’s a history tour with a haunted theme. It is not a haunted house with staged effects, or stooges popping out of corners unexpectedly. No jump scares! Even so, some reviewers have called the tour scary. Everyone may expect some eerie, if subtle, moments. Please join us with that in mind. Do you have to book in advance with a credit card? Yes. There are a limited number of seats for each of our tours and we often sell out well in advance. To ensure that you are able to join us, reservations and payment are required ahead of time. You can book online or over the phone with one of our reservation specialists. If you prefer to pay cash, your only option is to show up at the Old Town Old Town Corral Plaza at least 30 min prior to the tour departure. If we have seats available, you can pay cash at that time. PLEASE NOTE: Reservations are highly recommended as empty seats are rare as the tour time approaches. Once a booking is made, there are no tour date exchanges or refunds. This is our official statement. With that said, please do call us if something comes up and we will do our best to make things work for you. If you are cancelling please give us as much time as possible so we can sell your seat. When you book online, you will get an email saying your spot(s) have been reserved. If the tour minimum has been met, your card will be charged and you will get another email with details about the tour, where to meet and so on. We operate out of the Old Town Old Town Corral Plaza, please make sure to be there 15 minutes before departure time. Enjoy the tour and happy hauntings! Our Haunted Guided Tour is small to ensure personal attention to our guests. We have only 14 seats available per tour. We require an 8 person minimum in order for us to do a tour. When you reserve a spot you will get an email confirming that your spot has been reserved. Once 8 people are confirmed on the tour, we’ll send another email so you know that the tour is on. It will also have instructions on how to find us, and more information on the tour. Your credit card is not charged until we hit the 8 minimum. If the tour already has 8 people you will get the email immediately, and your card will be charged immediately. It is rare, but occasionally it appears that the tour will not go on. We will personally call and/or email you with a tour update 2-3 hours before your tour departure time. You will not be charged. Your credit card is not processed if the tour does not meet the 8 person minimum. If you book well in advance, bless you. Most people will book the day of their tour, so please be patient and remember: 90% of the time the tour fills the day of. Your confirmation will likely come sometime that day. Please call us 619.255.6170 if you have questions. There are two reasons for this. First, at least 8 people are necessary per tour for a sustainable business. The second, perhaps odd reason is that 8 seems to be the magic number of people needed for a great tour. Let us take you behind the scenes here. Once in a while we will get a 4.5 or lower star rating by a reviewer. Almost every time we get that low of a review, the tour had less than 8 people. Experience shows we need that many people for the group to relax, and the guide to give the great presentation we are known for. All sales are final. There are no tour date exchanges or refunds. Just like a concert or theater performance, once the tickets are purchased, the seats are considered sold. We do not offer refunds, nor can we change your booking to a different night or time if you miss the tour. Even so, we are human too, and know things happen. At our discretion and circumstances permitting, if you must cancel, we will do our best to make things work for you. You must contact us 619.255.6170, and if we can sell your seats before the tour, we will happily refund your purchase. So, the sooner you contact us, the better chance we have to sell your spot(s). It is extremely rare, but we are not perfect and everyonce and a while someone will have a less then great experience. If this happens to be you please call us 619.255.6170 and give us a chance to make things right. Deep gratitude. We do not have a waitlist. If you are trying to book a full tour, your best bet is to show up at the Old Town Old Town Corral Plaza at least 30 min prior to the tour departure. If there has been a cancellation, we will know by the time the tour starts and will get you in. Cancellations are extremely rare; only a couple a month, so this is a long shot option. Don’t miss out – order now! Do you offer discounts for Seniors, Military or anything else? No. Our bus only holds 14 people per tour. Because seating is limited, we do not offer discounts. Our ticket price is $35 per person – no exceptions. If you have a group of more than 12 individuals, please call our reservation line to discuss potential discounted options – 619.255.6170. We keep our tour groups small at 14 people maximum, to ensure a personal touch. Our tickets are only $35 – competitive with everyone; lower than some tours with lower ratings. We must pay for you to see some of the locations we visit. Unlike many tours, we have a driver and a host, which ensures your tour is safe and top quality, and this costs us more. If you enjoy the performance of your host, yes! It is customary to thank them however you see fit. Your host is a trained, experienced, and knowledgeable professional who puts a lot of effort and energy into your experience. Your generosity is always appreciated. It is how the host makes much of their income. Remember the driver, too, if you are pleased with your evening. You should arrive in Old Town at least 45 minutes prior to the tour departure. There is parking available, but it can be limited. You may have to walk a couple of blocks. 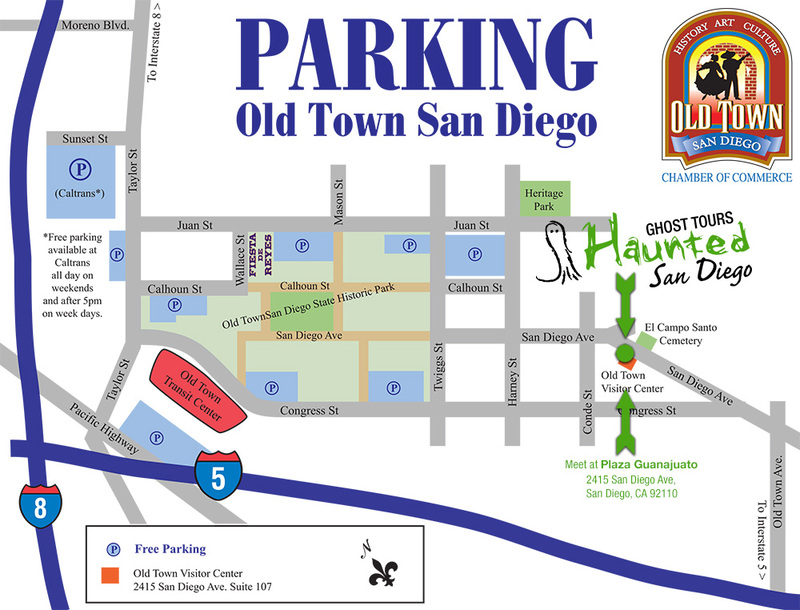 Click here to download the old town parking map! Consider using Lyft, Uber, or a taxi, and forget parking. Please make sure to be at the plaza 15 minutes before your tour embarks (6:45 for a 7pm tour and 8:45 for a 9pm tour). When you get there you will see our coffin shaped podium, and our ghost host dressed in Victorian attire. Please introduce yourself to the host, have the ticket buyer give their name, and you are good to go. A physical ticket is not required. We use the purchaser’s name. Give that name to the host and they will mark you off. Haunted San Diego Ghost Tour combines a walking tour and a bus tour. We will visit 5 locations in San Diego on a 2 hour sightseeing, storytelling adventure. We do enter into some of the locations on the tour, though not all of them. Remember; our tour is a storytelling adventure, and not a museum tour. We will visit “America’s Most Haunted Location”, a creepy mansion in Sherman Heights with a story to tell, plus two locations in the Gaslamp Quarter. You will end up (so to speak) in San Diego’s oldest graveyard, El Campo Santo Cemetery. We take you into 3 (Horton Grand Hotel, Davis Horton House and the El Campo Graveyard) of the 5 locations – more than any other haunted sightseeing tour in town. 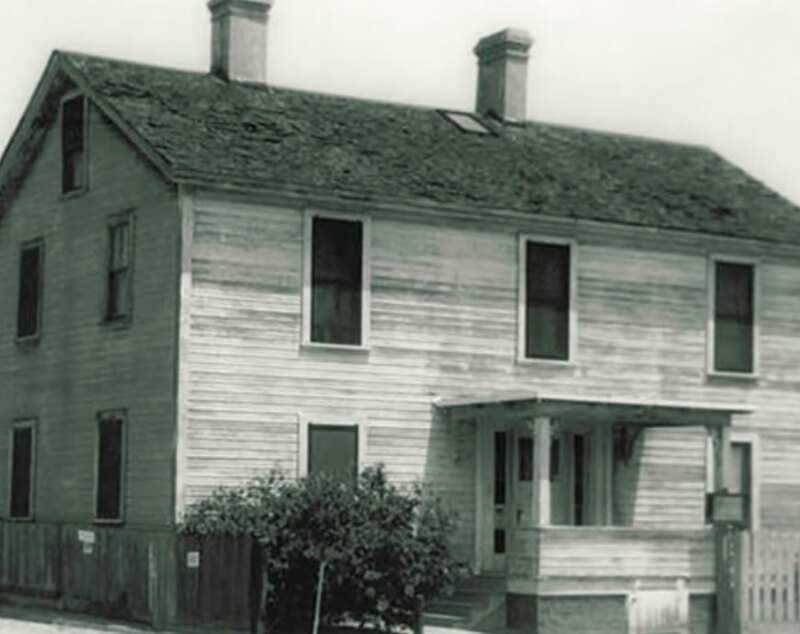 What about the Whaley House? Our tour walks about half a block to the Whaley House. You’ll enter the grounds and see the house, but not enter. We’ll tell you about the Whaley House, who lived and died there, and the circumstances that make it a ghostly hot spot. You’ll learn more about the Whaley House later on, at the graveyard. The Whaley House has its own tour, which we recommend. They control and care for this historic site, which is their specialty. This means they can go into much more depth, at the cost of not seeing the intriguing variety of haunted places San Diego has to offer. At one time we did tour the Whaley House. Since your tour takes roughly two hours, and there’s already plenty of walking, we decided to give you the highlights and show you a variety of fascinating, spooky sites. What makes our tour different? Haunted San Diego Ghost Tours is San Diego’s best, and among the oldest ghost tours. We provide an entertaining, history oriented tour with a haunted theme, described by knowledgeable, professional storytellers. Unlike other ghost tours, we offer only one type of tour. This allows us to focus on providing guests with a fun and educational experience, regardless of whether you believe in ghosts or not. All of our guides are theatrical storytelling specialists who will take you around San Diego aboard a coffin on wheels. You will have an opportunity to see an actual haunted artifact during our time together, and we’ll show you proof that ghosts exist! Our tours run year round. Every group gets on and off the bus at each location that we visit. We are the only ghost tour in town that is allowed to enter into the oldest, creepiest surviving structure in the San Diego Gaslamp. Don’t just take our word for it – check out reviews from guests that have taken our tour. Look us up on Yelp! or TripAdvisor. We’re proud the best review sites rate us the highest among San Diego ghost tours. Your host is not the driver! 1. Safety first! Anyone telling stories while driving may become distracted. This means they might forget and skip over important stories on the tour as they deal with traffic. Worse, they may get into an accident. We provide you get a driver and a host on your tour. The driver concentrates on the road and your safety, while the host focuses on the performance, stories, and your good time. Many touring companies skip on having a separate host and driver to cut costs by just having one person perform both jobs. Comparison shoppers will notice they don’t pass the savings on to you! It also makes for easier scheduling. But where is your quality experience in such multi-tasking? 2. Entertainment. Your ghost host will be standing at the front of the bus, enthralling you with San Diego ghost stories the entire time you are on the tour. There is no storytelling break while you ride. They are directly involved with you at all times. This keeps them on top of their performance – not distracted by traffic. 3. . We keep an eye on the bus and your valuables. You’ll be getting off at every haunted location with the host guiding you. The driver will stay with the bus so your valuables are watched over, and kept safe. Join us for the unique activity of a lifetime! The most entertaining, historic tour with chills and thrills ever! Never Been On A Ghost Tour? Join Us. We’ve Been Dying to Meet You. Our Historic Tour is an Experience You’ll Never Forget. Ready for some spooky fun? Reserve your plot…we mean…SPOT today! Please let us know if you need any more information or have comments.